What good is creativity without know-how? When it comes to fashion design you may tend to think about the creative aspects of designing. Trend boards, sketches, creating colour cards, draping, you name it. But who is going to make these stunning designs? Before you can produce anything, someone will first have to come up with the patterns and cut them. This is when the more technical side of designing comes into play. Pattern drawing is a much sought after skill in the fashion industry, yet there are still very few people who have truly mastered this profession. 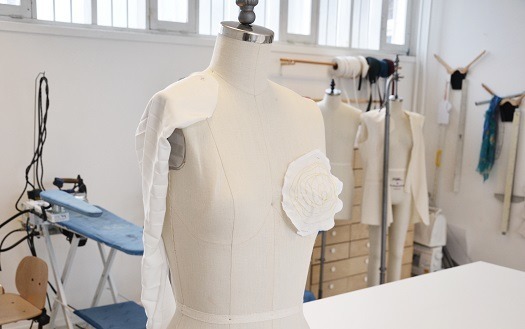 At the academy considerable attention is rightfully paid to pattern design and cutting, in both undergraduate programmes and part-time courses. The part-time Pattern Cutting and Production Techniques course had been barely announced when all available places had already been filled for this year. Keep an eye on our website because this in demand course will be running again in February 2018. If you can’t wait that long, then sign up for the summer course Creative Pattern Cutting. For an entire week you can completely immerse yourself in all the ins-and-outs and skilled techniques involved in pattern drawing. You certainly won’t regret it!